In the wake of an operational fiasco at Winnipeg Transit last week, the head of city hall’s public works committee says Winnipeggers, and those elected to govern them, have to rethink their priorities in making ends meet. Coun. 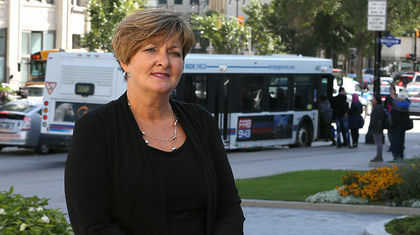 Janice Lukes (St. Norbert) said if Winnipeggers are to get an improved, more reliable Transit product that continues to advance with the times and needs of its users, the money will have to come from somewhere. Questions about Transit’s operations arose last week when the city was forced to reduce bus service after problems with engine emissions controls took nearly 100 buses off the streets for repairs. It led to a slew of negative headlines in a city already entrenched in a contentious back-and-forth over rapid transit plans. Lukes believes, in general, Winnipeggers’ views on the importance of transit is much more favourable than even five years ago. In that setting, she believes, you will find a population more agreeable to change. Lukes said a national transit strategy would be helpful, but she’s not holding her breath on that, nor for greater funding from the province. He said Transit is “not pleased with the progress of the contractor,” but said there’s no plans of cancelling the program. A Winnipeg transit advocate said he would give the city’s bus service a failing grade, even before a mechanical catastrophe wreaked havoc with scheduling earlier this month. Dave Mouland has been using Winnipeg Transit since he arrived in the city in 1968 and said service in the city has regressed in recent years. “I think we’ve regressed dramatically,” the volunteer with the Winnipeg Transit Riders Assocation said. Transit has come under great scrutiny in recent days with the city admitting a faulty emissions system led to a number of buses being taken off the road for repair, which in turn led to scheduling difficulties. Mouland said that was an issue Transit should have known about and dealt with months ago. Janice Lukes is calling on Winnipeggers to raise their voice. The city councillor for St. Norbert said city councillors should be told where their constituents stand on the issue of Winnipeg Transit. Lukes said past councils have never dealt with a large public outcry on the issue. “I’m just hoping we have that now,” she said. “I’m hoping that people really voice their concerns. I’m encouraging it on Twitter, I’m telling people tell me what you think, tell me about the routes. I want to hear. And I want all residents that want to see better transit to call their councillors so that they understand. * Winnipeg Transit has a fleet of 585 buses. * The average bus travels about 50,000 km each year. * A bus can operate for approximately 35 hours on one tank of fuel. * Winnipeg Transit spends about $18 million on fuel each year. * Winnipeg Transit employs 1,560 people, including approximately 1,100 bus operators. * Engines are completely overhauled after 400,000 to 800,000 kilometres. * Average lifespan of a Winnipeg Transit bus is about 18 years. * A new bus costs approximately $500,000. * Winnipeg Transit currently purchases 32 new buses each year. * There are approximately 5,170 bus stops in Winnipeg. * There are about 870 bus shelters, 122 or which are heated. * There are approximately 2,005 transit benches in Winnipeg.